Seamounts are mountains rising from the sea floor to below the surface. They are the remains of extinct ocean-floor volcanoes that last erupted many million years ago. Most are found rising from a seafloor of 1,000–4,000 metres depth. There are an about 100,000 seamounts in all the world’s oceans, with only a few having been studied. Seamounts come in a wide variety of structural shapes, from conical to flat-topped to complexly shaped. Some are built very large and very low others are built more steeply. 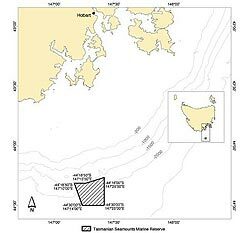 Australia’s largest cluster of seamounts is found about 50 to 170 km off the coast of southern Tasmania in an area known as the Huon Commonwealth Marine Reserve. It contains about seventy seamounts. This reserve ranges from 70 to 3,000 metres below sea level and occupies an area of about 370 square kilometres. Some of these seamounts are up to 25 kilometres across and rise 500 metres from the sea floor. Peter Etnoyer, WHOI, NOAA, the Alvin Group, and the 2002 GOA Expedition science party.